Battle unusual enemies ranging from washing machines to feline ice lollies, exploring a randomly generated maze to hunt for power-ups and save your kittens! The deeper you go, the harder it gets - building to frantic, psychedelic action inspired by the best shooters of the early nineties! This is a passion project and I work on it in my free time. I intend to run a small Kickstarter campaign this year to help spread the word, build a small community around the game and raise funds for a limited edition production run. I've started this devlog to share what I'm up to and document progress. This community seems really supportive and knowledgeable so any feedback I get will be appreciated. Man, this is just awesome, the music it's outstanding and everything is totally epileptic and absurd, it's like a Dali's picture in movement, I love it. Robotron 2084? Yes. Yes, please. The train cat delivery part at 0:56 is epic. This looks like so much fun and the music is great!! Thanks everyone for the great comments! It's exciting to know other people like what I've been working on too. I really enjoy the clean and intense game play of well made twin-stick shooters. I think that with controls that have been balanced just right you can sink into these games like no other - there's not much that can rival the satisfaction of just nailing a tough wave perfectly. I hope to surprise the player with lots of fun different enemies, with varying scales and behaviours so that they never know what is coming! It's an ambitious aim at the moment but I'd like at least 100 enemy types when it comes to release. Something that I like about the train sequence is that it's a layered combination of enemies - we have the large and deadly high-speed train, which once you derail it unloads a swarm of small cat-lollies. I'd like to build on the concept that different enemies of the world can interact with each other, in this and other ways. This looks insane and amazing. The giraffe bit and the train bit was fantastic. More games with cats and trains. Thanks DizzyDoo, your project looks fun too! It's taken about a year to get where I am, a few redesigns of how I wanted the core of the game to work (enemy generation and level style) meant I completely changed the process of generating both. I've now settled on something that allows me to make the game I wanted to all along, whereas my first iterations were compromises. Whilst being a traditional wave-based twin stick shooter at heart, from the start I wanted to give the player some freedom to explore and feel like they were not just defeating screen after screen of enemies. The game is structured into map 'layers', which each comprise of a grid of rooms. A room takes up the whole screen and contains one wave of enemies. There is a wall around the room, and on clearing the wave of enemies a selection of routes forward open, allowing the player to move through a randomly generated maze. To give the feeling of a richer environment, each room of the maze will have a few defining features, and will have an environmental 'zone' which determines the choice of scenery props and backgrounds. I've had a small break from making games whilst I worked on other things, and I have decided that to get myself back into it I would take a smaller project from genesis to completion, including exploring a couple of avenues of distribution. I feel it will be a really useful learning experience as I have not done this before. Given that I want to make an abundance of tiled backgrounds for each of my rooms, I thought I would start by making a small utility to help myself do this, and perhaps other people would find it useful too. The program has one main function, and that is to assist tiled image creation by looping brushmarks from edge to edge, and showing a live preview of how the tile would repeat. I've mocked up a basic interface, and implemented a basic 1 pixel pen, bucket fill, dropper tool and export to PNG. I'm considering rolling tools like this into the game to allow for user generated content, so this is pretty exciting. There's lots of fun facets to this mini-project so I'm looking forward getting stuck in and adding a decent amount of features, such as other simple tools, and animations. It definitely looks super mega! If there's a Kickstarter tier for that soundtrack you have my money. I haven't pinned down all of the Kickstarter details yet, but I'd love to have an OST tier. I'll post a big new update later this week, but I thought I'd just share a screenshot of a couple of scenery assets I drew (fairly) recently. These lollies are planned to be some of the scenery on the desert stages. I found an Android app called Dotpict which is a great little tool for drawing pixel art on the go. The main reason I love it is that it is so much easier to control than other apps, as the pen is not where your finger is it allows you to see what you are doing. I'd recommend giving it a go. Damn, that is a nice popsicle. I'm really pleased with the progress made so far with the tile maker tool, now that I've got some foundations for my interface down I can soon focus on the functionality. I've made modular tool panels which you can drag around to wherever you want them, and close them if you don't want them. I also had a bit of fun drawing my own tool icons, which was definitely a great use of my time! Spent a little time the other day finishing the function that lets you zoom in and out of the drawing for easier editing. Whilst doing this I also added a nicer grid overlay, this stays at 1 physical pixel at all times, I think that it is much easier to read and use. I also implemented functionality to work with canvases of any dimension, but I've not yet added an interface for changing it – I intend to just let the user pick this when they start their drawing, and for the time being I've restricted it to sizes between 8x8 pixels and 64x64 pixels. Now that this is all done I can build the routines that save and load images! This should include the framework for the animation system. Two updates in one day! I decided to try out a small idea I had to improve something that was in the back of my mind for a while. As shown below, because the simple enemy types always ran straight towards the player, they could easily be shepherded into a very tight group – and eventually all overlap completely. Implementing path finding or another type of collision/overlap check would too expensive given the number of enemies I want to have on screen, so I tested the simple idea of giving a random amount of variance to the direction that the enemy looked towards. I am pleased with the result – especially as I have decreased the frequency of the direction check so I should have a small performance increase too! Previously every enemy would update to look at the player every single frame, and with this new method I have pushed this to every quarter second. If I stagger the checks then this should be great. I'm pleased with the look of this as it keeps large groups of enemies looking like an intimidating swarm! It's been a little while since I posted any updates; life has been fairly busy and I've not given my project as much time as I would have liked. I have made some good progress with my tiled image creator, I've nailed the importing routine, and set up a nice panel which allows you to easily change between frames of the animation. The animation also previews in the same panel, looping continuously, currently at 5FPS. You can see in the GIF that once the images are loaded, the changes get updated in near-realtime in the animation and preview panel. The images auto-save every second, something I decided to implement after noticing dotpict does a similar thing; it is nice to know that my drawings will be safe. Now that I've sorted out a lot of the loading/saving issues, and animation preview I can bulk up the functionality of the actual tools and push this mini-project closer to being completed. 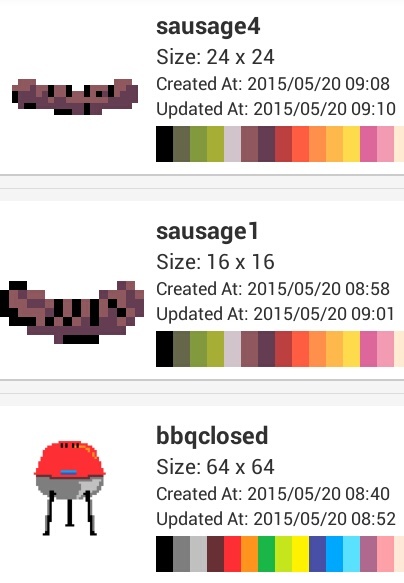 Just for fun, here is a screenshot of a barbeque and some sausages that I drew on my commute on Wednesday. I'm looking forward to setting up the barbecue as a sausage spewing mini-boss! Quick update today, added variable pen sizes to the tiled image utility program – and an outline that moves to show you where the pixel will be drawn. You can hopefully see in the GIF that the red outline snaps to the pixel grid of the drawn image. Maybe soon I'll get back to making the actual game! This is a fun diversion, but I can't forget it's not my actual project! If anyone has any other ideas that would be really interesting to hear! In any case, I'd like to keep the scope fairly small, and this is already getting quite feature rich for a side project! Also, if anyone has any idea why the GIF above renders with grey marks once I upload it to my server and preview it here, that would be great to know. Awesome music. Getting really strong Llamatron vibes too! Llamatron was a big inspiration, it's cool you can see it - though hopefully what I have planned will be enough to make it feel like it's own game and experience in its own right too! Keeping things feeling fresh and original is important in games where you are inspired by other great examples. Today's update is just to show off the next step towards feature-completeness in the tiled image app – I've added a straight line mode. It's a little janky on pens that have been set as thicker than 1px; but as you can see it works! - Straight line tool DONE! I've decided to ignore the spray/dither tool for now, and also the round pen tool so I can get this mini-project wrapped up faster! I was asked by a member of another forum to implement angle snapping with the line tool when you hold SHIFT. It's a bit rough around the edges, but a 1.5 hour session got it working on Sunday! I also improved the line drawing function so now there is less aliasing on lines with particular angles.